Calling Drama and English teachers! 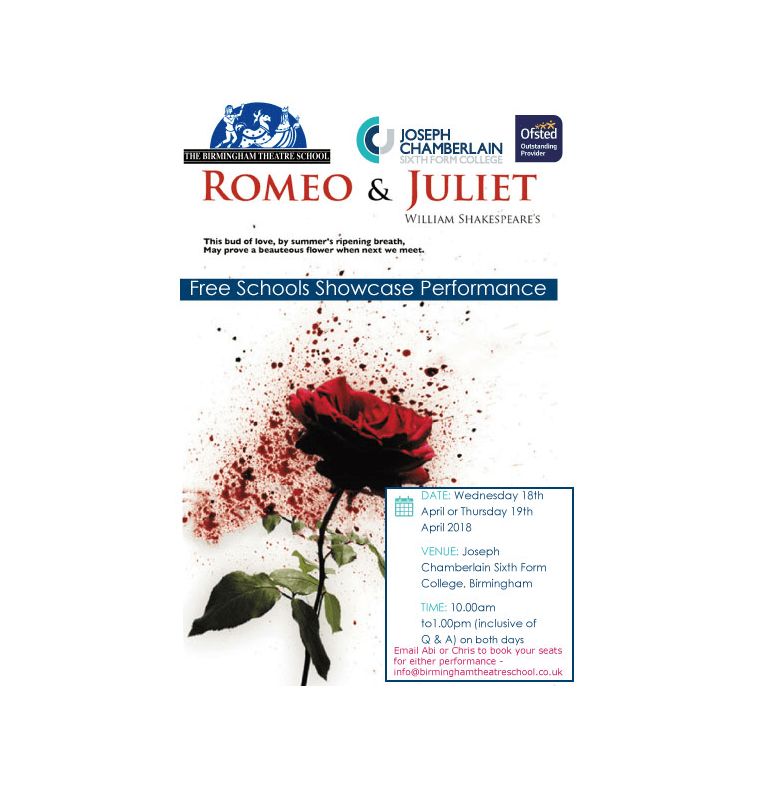 The Birmingham Theatre School, in association with Joseph Chamberlain College, are holding two free performances of Romeo and Juliet for schools in April 2018. This production has been created as part of the Rep Festival week and has been extended to include performances specifically targeted to school students studying English or Drama for their GSCE. This is a unique chance to see a live production of Romeo and Juliet, which is so often an integral part of school students’ English GCSE study. This is a perfect last minute revision refresher! (The performance lasts approximately 1 hour & 45mins, plus a 20 minute interval. This is followed by a Q and A of approximately 20 minutes. The school has been training actors for more than 75 years and its professional touring company has been visiting schools for more than 15 years. If you would like to book a school party for either Wednesday 18th or Thursday 19th April then please contact us by return and we will be happy to reserve you a set of tickets. We are offering each school the chance of booking up to 40 free tickets plus support teachers. This is on a first come first serve basis. We have around 250 tickets available for each performance.